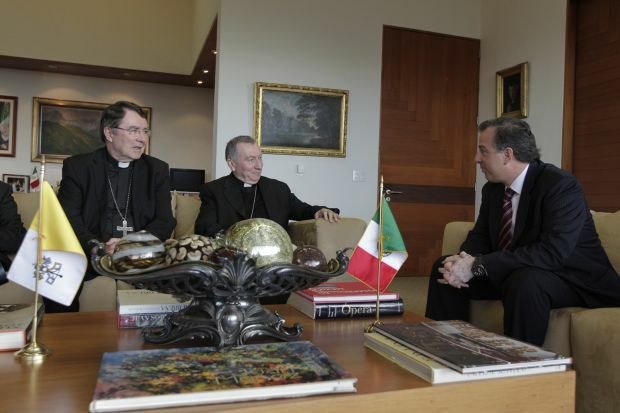 Mexican Foreign Minister Jose Antonio Meade Kuribrena meets with Cardinal Pietro Parolin, Vatican secretary of state, in Mexico City July 13. MEXICO CITY (CNS) — The Vatican’s secretary of state pledged full support for addressing the issue of child migrants streaming out Central America in search of safety and family reunification in the United States. Pope Francis, meanwhile, described the situation a “humanitarian emergency” and called for the international community to act. Speaking at the Mexico’s Foreign Relations Secretariat July 14, Cardinal Pietro Parolin repeated a recent call of bishops in five countries for Catholics and society at large to lend a helping hand for the thousands of young migrants traveling through Mexico and often arriving unaccompanied in the United States. “Given these migratory facts, we urgently need to overcome primitive misgivings and again propose common strategies at the subregional, regional and world levels that include all sectors of society,” Cardinal Parolin said in a speech attended by clergy and the foreign ministers of Mexico, Guatemala, El Salvador and Honduras. The cardinal traveled to Mexico as countries in the region came to grips with an increase in the number of Central American migrants not seen in decades — and an influx so unexpected and massive that U.S. officials have had difficulties properly processing those arriving at their border. It also came as countries such as Mexico confront longstanding issues such as crimes committed against migrants with impunity and an indifference toward providing protection to Central Americans traveling through the country — even as Mexico complains of the treatment experienced by Mexicans living in the United States illegally. The plight of the child migrants has the full attention of Pope Francis, who sent a message in advance of the forum, jointly sponsored by Mexico and the Vatican. “I wish to also call attention to the tens of thousands of children that emigrate alone, unaccompanied to escape violence and poverty,” Pope Francis said in the message, dated July 11 and read July 14 by Archbishop Christophe Pierre, papal nuncio to Mexico. “This is the category of migrants from Central America and Mexico itself that cross the United States’ border under extreme conditions and pursuing a hope that, for the majority, will be in vain. “This humanitarian emergency requires, as a first urgent measure, these children be welcomed and protected,” Pope Francis continued. “Many people forced to emigrate suffer, and often, die tragically; many of their rights are violated, they are obliged to separate from their families and, unfortunately, continue to be the subject of racist and xenophobic attitudes,” the pope said. The pope also called for information campaigns on the risks of migrating and a commitment to developing the poor countries of Central America. Cardinal Parolin committed the church to finding solutions and offering assistance — something already carried out by a string of Catholic-run migrant shelters stretching the length of Mexico, which offer spiritual and material support for the thousands of Central Americans transiting the country, often atop a train known as “La Bestia” (The Beast) for the way it maims so many migrants. “The church will always support at the national and international level any initiative directed at the adoption of correct policies. No institution, not even the state, possesses the necessary economic, political or informative resources or social capital or legitimacy to resolve the root problems with emigration,” the cardinal said. Central America suffers from high homicide rates, gang violence and some of the worst poverty in the hemisphere, motivating many people to leave for the United States, where they seek safety and earn money to support families left behind. But Central American children have been abandoning their countries of origin in recent months, especially as rumors spread in the region that any youngster arriving in the United States will be allowed to stay put. Catholics working in Central America and with migrants and government officials say many parents see this as an opportunity to remove their children from dangerous circumstances, but also reunifying long-separated families. “Many (migrants) have family in the United States and they’re looking to reunite,” Sobeida Mejia, a regional director for child migrants with the Honduran childhood and family institute, told Catholic News Service. Mexico has announced a measure to make migration more orderly — especially on its oft-neglected southern border with Guatemala — and to respect the human rights of those traveling through the country. “In Mexico, in Central America, in Guatemala, in Honduras, in El Salvador, in the United States, migration has a child’s face, and it obliges us to reflect more deeply and in short time frames,” said Mexican Foreign Minister Jose Antonio Meade Kuribrena. “Respect for human rights, safeguarding against trafficking, exploitation and organized crime and access to health services and consular assistance must be priorities of public policy in the transit countries,” he said.